We actually recorded this show early last week but time didn't permit us to post it. Consider this a retreat back to winter break. Also, Bill goes off on a tear about hateables on Twitter. It's a riot times 10, and all the better for sending you off on your way toward 2011. - Stupid Dell XPS laptop flashmob in apathetic café setting. - Burberry's bohemian holiday folk track. - Help Luckie decide where to give. - Have a half-assed crowdsourced Ducati Christmas. - BONUS: A Christmas Story gangsta remix. 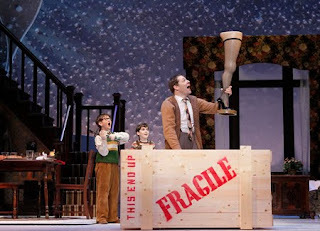 Image credit: Culturemob, for A Christmas Story: the Musical.